Gift of Jonathan J.G. Alexander, in honor of the 75th Anniversary of the Morgan Library, the 50th Anniversary of the Association of Fellows, and the curatorship of William M. Voelkle, 2000. Phillips sale (London, Oct. 20, 1983, lot 467) to Maggs; Maggs catalogue 1059 (Papyrus to Paper, 1985, no. 65); purchased from Maggs by Jonathan J.G. Alexander in 1985; gift of Jonathan Alexander in 2000. Ms. single leaf with miniature depicting the Betrayal of Christ; written and illuminated in Rouen, France, ca. 1530. 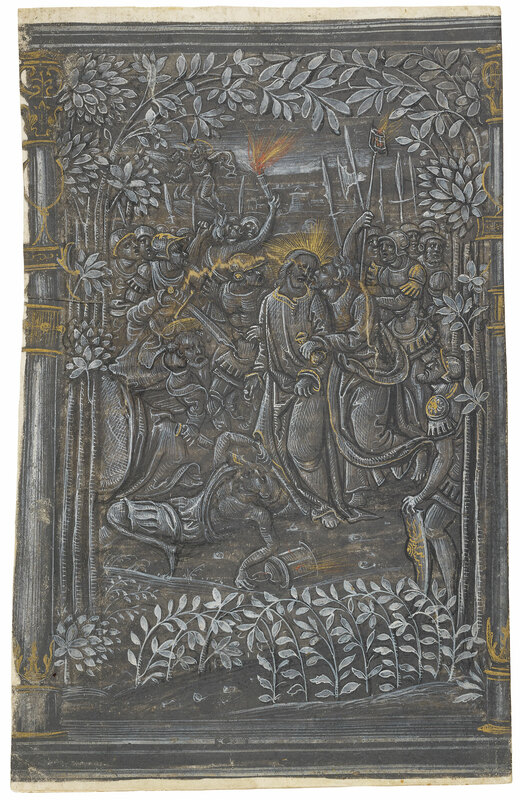 Decoration: 1 miniature depicting the Betrayal of Christ. The miniature belongs to a cycle of 15 grisaille miniatures excised from a manuscript of the P̈oème sur la Passion by Jacques Le Lieur (ca. 1475-ca. 1550), pasted on paper and bound up into an early sixteenth-century printed Book of Hours, purchased by Maggs at a Phillips sale ( London, 20 October 1983, lot 467). Maggs offered 4 miniatures for sale in 1984 (Maggs, London, European Miniatures and Illumination, Palaeography and Calligraphy, Bulletin no. 12, June, 1984, nos. 96-99 [no. 98 is Paris, Les Enluminures, cat. 10, 2001, no. 12]) and 8 (with one overlap from the previous batch) in 1985 (Maggs, London, Papyrus to Paper, Catalogue 1059, nos. 64-71). One miniature was resold by Bruce Ferrini in 1995 (Medieval and Renaissance Miniature Paintings, Catalogue 3, no. 50; which reappeared in Paris, Les Enluminures, cat. 10, 2001, no. 13); three miniatures that had been acquired by Neil Phillips were offered at Sotheby's in 1997 (London, 2 December 1997, lot 80). Although all the excised leaves were pasted onto paper, enough of the text is visible to reveal that it is in French and written in bastarda, first identified by Dr. Myra Orth and described in a paper given at the ICMA in Kalamazoo, Michigan, May 7, 1987, Session 90, entitled: "More Detached Folios in Search of Other Illuminated Manuscripts". Artist: Circle of the Master of Girard Acarie, who painted the miniatures in Pierpont Morgan Library MS M.147, the dedication manuscript of this text, written for François I and his mother Louise of Savoy, and also dated to ca. 1530.